Sofia's first dentist visit was today, and she did great! They also did digital x-rays to check how her grown-up teeth are coming up, and they look great (knock on wood) so it appears that using the pacifier hasn't affected them. 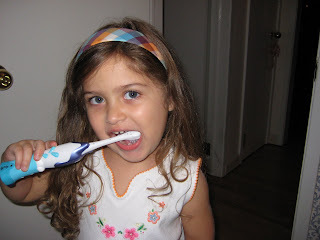 So of course Muffin spent the whole weekend showing everyone her beautiful clean teeth, and everytime she washed hands she also wanted to brush her teeth with the spinny toothbrush. What fun!